Our "Breeders' Directory" is for the use of dedicated aviculturalists and hobbyists who have a genuine interest for the purity and welfare of the species and who can provide expert knowledge for the birds they breed. 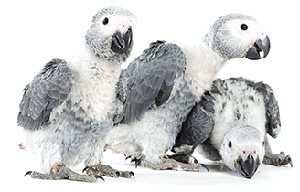 The Directory covers all parrots and parakeets from the smallest to the largest. It is in its early stages and will be added to on a continuing basis. Entry in the directory is FREE and you can be included by contacting Parrots magazine by email or call us on 01273 464777 with your information. All we need is (1)your name, (2)common name of the species you breed, (3)its scientific name, (4)a landline number (if you have one), (5)a mobile number (if you have one), (6)an email address (if you have one) and (7)the area you are in (e.g. Essex, Cumbria, Cornwall etc). Any other personal information you provide will not be shown and will not be disclosed to any other party outside of Parrots magazine unless with your authority.